As expected, the next flagship smartphone from the Chinese manufacturer is just around the corner shortly after the launch of the Umidigi Z2 Pro. This one is named Umidigi F1 and will offer upper mid-range hardware. I think Umidigi company did not hesitate to borrow the name F1 from the name of the cheap flagship Pocophone F1. Too much is not yet known about the Umidigi F1. What is certain, however, is that the mobile phone will have a 6.3 inch display and will therefore undoubtedly be one of the larger smartphones. The display has – typical for the upper middle class – a Full-HD+ resolution and is in 19:9 format. Thus, the smartphone should be neatly positioned, at least in terms of pixel density. As picture technology, we expect classic IPS, which should bring natural colors and good viewing angle stability. AMOLED panels are still quite rare with the smaller manufacturers like Umidigi, but we don’t consider this a serious disadvantage. An IPS display can also deliver a very nice picture. A special feature of the Umidigi F1’s display is that the Notch is held in the shape of a drop of water and therefore takes up very little space. We already know a comparable design from the OnePlus 6T and the Nubia Z18. Of course, the F1 has a recess in the display and doesn’t look as tidy on the front as the Xiaomi Mi Mix 3 or the Vivo Nex, but a refreshingly different design is the Waterdrop Notch anyway. Nothing is yet known about the other external features of the smartphone. So it’s not yet clear whether the case is made entirely of metal or whether the back of the case is made of glass for wireless charging. Something more, however, is known about the “inner values” of the smartphone. The Umidigi F1 will be equipped with the latest Helio P60 processor from Mediatek. This CPU can also be found in the Umidigi Z1 Pro. The Helio P60 works with four Cortex A73 cores with up to 2.0 GHz in the power cluster and with four Cortex A-53 cores with up to 2.0 GHz in the energy saving cluster. The graphics unit is an ARM Mali G72 with 800 MHz clock frequency. We assume that the smartphone is equipped with 4 GB RAM and 128 GB ROM. Should Umidigi have taken system optimization seriously, we can expect a smartphone with good performance for daily use. The system will be Android 9.0 Pie. Users don’t have to worry about an update to the latest Android version, but if the smartphone works without bugs and errors, we have to check it first in a detailed test. The battery of the Umidigi F1 is supposed to deliver a good capacity of 5100mAh. With system optimization the Umidigi F1 can be used for about 2 days without recharging. Thanks to Mediatek Pump Express, the charging process should also not take too long. The device has a dual camera on the back, a 16MP + 8MP setup with F/1.7 aperture, and the smartphone will come with a 16MP high-resolution selfie camera. Overall, the UMIDIGI F1 is a just 8.8 mm thick phone with such extraordinary features. The Umidigi F1 could be a good smartphone – or not. Ultimately, it’s once again a question of whether the manufacturer is careful with software optimization and processing. In the case of the recently introduced Umidigi Z2 Pro, this was certainly not the case. We also think it’s a bit worrying that Umidigi is already sending the next flagship into the race. After all, the Umidigi Z2 Pro still has a lot of room for improvement, which may now be in favour of the new flagship. The only (unexpected) drawback is that lacks the proximity sensor or at least I cant find it. The Umidigi F1 could be a good smartphone – or not. The hardware sounds very promising. Ultimately, it's once again a question of whether the manufacturer is careful with software optimization and processing. Nevertheless, we are very excited about the Umidigi F1, as the smartphone simply represents a good combination of current mid-range standards: A fast processor, a strong battery, small display edges and USB C with headphone connection. Whether it's really a Wish-less-Happy package or a failure. When is UMIDIGI F1 available? 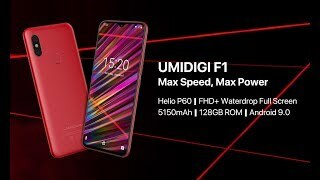 As stated, UMIDIGI F1 is expected to open sale at a crazy price tag $199.99 on 7th January 2019.